Top creatives reveal what they wish they had known in college, to give you a head-start in your creative career. Design school is great. It gives you the opportunity to mature as a designer, illustrator or artist, prepares you for your future career, and helps you develop the beginnings of a design portfolio. But it can't teach you everything. With that in mind, we've talked to some successful creative professionals and asked them what they wished they had known when they were at art college – so you get a head-start on your course mates. “The one key thing I don't remember being taught was how to actually find work,” says seasoned pro Ben the Illustrator. “How to market ourselves, approach potential clients and so on. Whether we were going for full-time jobs or freelancing from the outset, nobody really knew what to do once we left college. Check out our 5 essential rules for self promotion for guidance in this area. “For me, I would say there is a major void in higher education,” explains illustrator Aaron Miller. “You are taught about unrealistic deadlines and creative outputs from the start." "Being successful is 60 per cent making great things and 40 per cent being a reliable employee and coworker," says senior art director Charlotte West. "Graduates need to understand that a gorgeous portfolio may get you in the door, but to move up and be someone people want to work with, you better have a solid work ethic and be a team player. "On my team, if you want to be considered a valuable designer, you need to make deadlines, have a positive attitude, be willing to learn new things, and help out. In school, it felt like ‘rockstars’ of the office would be the designers coming up with innovative visuals, but in reality the real rockstars are also hard workers and good people. Be the designer everyone knows they can turn to in a crisis." Illustrator and designer at Empire magazine Olly Gibbs joined the Association of Illustrators to help boost his career and client list. At art school, he feels he missed out on advice for turning yourself into a product that could actually sell. The moral here? Join an association that can help you sell yourself! "Despite what your teachers or parents tell you, your diploma won’t necessarily get you a job," says Toronto-based web designer Janna Hagan. "Proving what kind of work you are capable of producing through your portfolio, or demonstrating passion and potential will more likely catch a potential employer's eye; compared to a student who has more formal education. Having a killer portfolio and personality will land you a job anywhere." Jeffrey Bowman is a freelance illustrator and graphic designer based in the mountains of Hemsedal, Norway. Formerly of Studio Output and a lecturer at Shillington College, Bowman has worked for numerous clients around the globe. So what does he know now that he wished he'd learned at art school? "Software skills," he says. "This is probably the most important thing to really focus on when you're at college or university." When Bowman was at university, this was something he had to teach himself, because there was no real help available. "Being software-savvy is only going to help when you get out into the industry, because the way the industry is, these kind of skills will set you apart from the next person applying for an internship or junior job." T3 magazine's art editor Jo Gulliver has been working in magazines for 15 years, during which time she's worked with the world's top illustrators, photographers and designers. When she was at college, she knew she wanted to be involved in magazines, but was never taught the process of putting together a magazine to be printed and exported across the globe. "It would be good to explore the industry you want to go into in depth," she says. The best way to do this is through seeking out work experience while you're studying. "Also consider visiting printers, agencies, photoshoots and so on," is her top advice. "Make the most of your work experience placement and ask to see all processes of the business. It will make you much more employable when you come to get a job." "It has been many years since I graduated from art school, but unless I overslept that morning, one vitally important lecture was missing – Managing Your Money," says magazine and newspaper illustrator Joe Cummings. "I feel that graduates entering the world of work, especially freelance work, need to have a basic understanding of taxation, national insurance and even bookkeeping." "Pensions, too, need to be understood at this early stage. It may seem crazy to be thinking of retirement when starting out, but the benefits are too important to ignore. Young creatives need to be aware of these expenses and bear them in mind when invoicing. I see too many struggle to price their work. Having knowledge at the outset may make you wealthier." "The main thing I know now, that I never realised at college, is that there is a market for good quality drawing," says Abigail Daker – a freelance illustrator known for her stunning perspective cityscape pencil drawings. 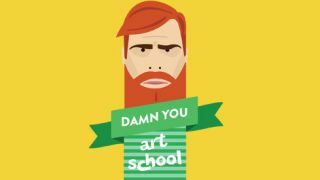 "There was a lot of theorising about drawing on my course and plenty of discussion about the merits of drawing and its place within the contemporary fine art world, but nothing about it as a commercial product, and no advice about how to tailor your artwork to be better suited to commercial projects." Daker's advice is to scope out the latter – no matter what your intended specialism. "Don’t take on projects at low rates in the hope of getting better-paid projects from that client in the future, especially if you don’t know the company, or anyone who has worked for them before, says senior creative at Animade TV, Lana Simanenkova. "In my experience, they either won’t come back to you and try to find someone else who is equally cheap, or will just expect you to keep working at that lowered rate every time. "Of course, it’s nice to have a constant stream of work and income when you graduate, but at the same time it can make you miss out on bigger and more creative opportunities elsewhere. In short, discounting probably won’t bring in big budget, high-profile projects with that client."